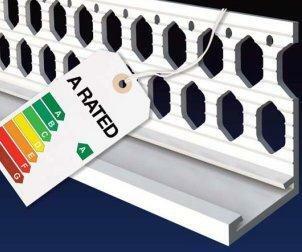 Renderplas PVCu beads offer the best environmental credentials in their market. Our beads are manufactured locally from recycled material, all offcuts are recycled, and all of the PVCu we use is recyclable when buildings are deconstructed. Furthermore, Renderplas PVCu beads eliminate the cold bridges that would be caused by alternative steel beads; so they tick all the right boxes when it comes to sustainability. Renderplas has also taken the lead in providing Ecopoint calculations for our products to assist the specifier in lowering carbon production. In an independent environmental profile report, Renderplas PVCu beads achieved the top eco-rating available to beading products on the UK construction market with an “excellent” Ecopoint rating of just 0.004 per kg installed. This remarkable Ecopoint score is largely achieved because between 96% and 100% of the PVCu used to make Renderplas beads comes from recycled material. The environmental impact of using a typical PVC extrusion with no recycled material, compared to a Renderplas Bead, is six times worse, based on Ecopoint score simulations carried out in the study. And the gap in the Ecopoint values compared with galvanised or stainless steel beads would be even greater again given a number of factors, including the energy required to recycle steel which demands heats of between 1200ºC and 1900ºC to be reached, the process of galvanisation or secondary process to turn it into stainless steel, and the high energy required to cold work the steel into strips; and all of that has to happen before the products are actually manufactured. The Ecopoint calculation for Renderplas PVCu beads also considered the total distance moved by every single kilogram of a finished product to its destination, whether it was a building site in Accrington or to the airport in Abu Dhabi. You can get a copy of the certificate along with any other documents you require from the Downloads page.